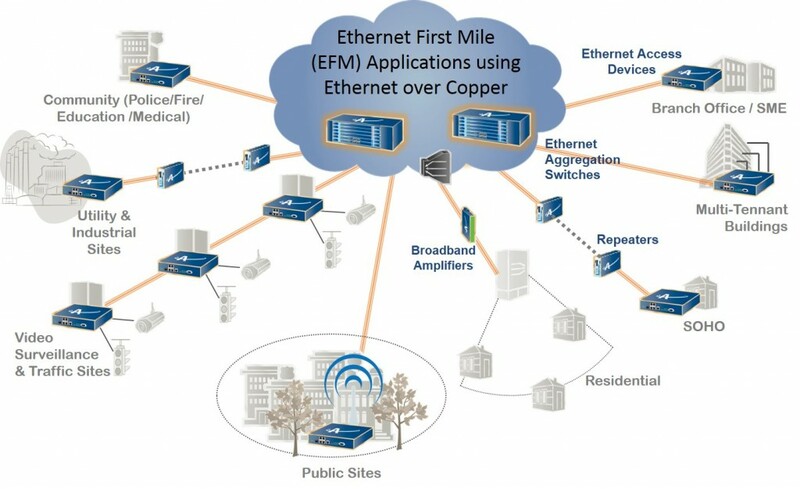 What is Ethernet First Mile (EFM)? cost efficient delivery of Internet access, VoIP and other services into locations difficult to reach by higher capacity copper or fiber methods. 2BASE-TL (802.3-2008), is a key EFM related specification for the delivery of full-duplex Ethernet services over voice-grade copper wiring. While typical Ethernet services are delivered in increments of 10 (10Mpbs, 100Mbps, etc. ), 2Base-TL allows for variable rate Ethernet transport to accommodate for throughput limitations due to variations in copper characteristics (length, wire diameter, number of pairs, SNR, cross talk etc.). Standard 2BASE-TL supports symmetric bitrates from 2Mbps - 5.7 Mbps, at distances up to 2.7 km, based on G.SHDSL. However, data rates and distances can be significantly increased with Actelis Networks copper bonding, amplification and unique EFMplus technologies. Why is Ethernet First Mile (EFM) Important? Copper is the most prevalent network access technology globally, reaching to residential and enterprise, public and remote locations that are not economical to otherwise connect to a broadband network. Ethernet over copper as defined by the EFM standard bridges the gap from traditional TDM services such as T1/E1 and low speed data access, opening up the potential to deliver standards based Ethernet E-Line, E-LAN, E-Tree and E-Access services anywhere copper is today, with as little as a single copper pair. Actelis magnifies the benefit of this leveraging unique technology that exceeds the minimal EFM line rates and enabling up to 15Mbps symmetric per copper pair. This is powerful for individual customers, businesses and remote sites of large companies that desire access to access Internet, Intranet and Cloud services (SaaS, IaaS, PaaS, BPaaS etc.) which are growing rapidly.